Are you a technology reseller? Find your vendor on PartnerOn. 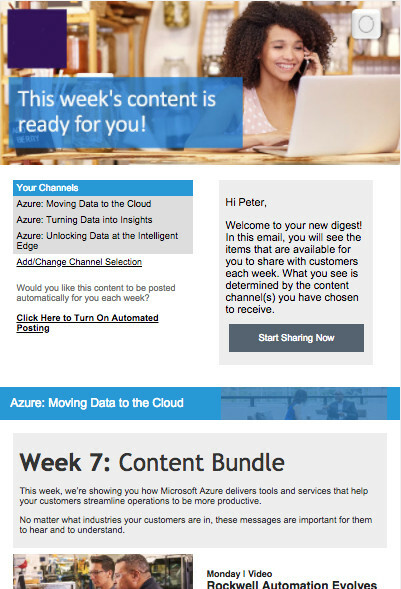 You can use Microsoft’s Digital Marketing Content OnDemand as a starting point. Empower your partners to build and optimize digital channel marketing strategy and execution, accelerate demand generation, and capture and close leads. If you’re like most channel marketers, you’re constantly trying to find new ways to keep your partners’ attention and get them selling better. You may try to do both by creating marketing and training assets that you then post to your partner-facing websites and/or portals. You may then track “asset downloads” as a metric of success, without actually knowing if your partners are really using the content you provide in market – and if that content is generating new leads for them. This is a traditional approach to partner-marketing that, after more than a decade, continues to rely on posting static assets to web portals and content libraries that partners waste hours navigating and then abandon. The “campaign in a box” did not solve this problem because, too often, partners do not have the time or resources to regularly search, customize, and publish new materials. They get stuck in the box, or lost in the portal, and your well-thought-out marketing assets and training tools go unused. At ContentMX, we provide a prescribed marketing program for partners using simple, customizable, step-by-step marketing plans that we help you to create. No need to produce special content. We can tap into the materials you already have, sort them into weekly campaigns and put them into context that partners can thereafter customize and distribute. Every week your partners will receive a message highlighting new videos, white papers, case studies, infographics, thought leadership articles, lead capture forms, training materials and more to publish to their end customers and prospects. This new content is provided in an elegant, prescribed and personalized manner allowing partners to customize it if they want, or to simply follow along and publish directly to their blog, email lists and social media. Each partner is also on their own timeline with their own unique login to the ContentMX platform. You not only provide partners what you want them to promote, but how and when to promote it. Partners can review, edit and publish the content after it arrives each week, or after review we can publish it for them. This new solution quickly impacts your channel, creating a “new behavior.” Partners will now wait with anticipation for new content campaigns to arrive every week. They will go from casual observer to engaged marketer, learning and promoting your business each step of the way. Now even that 1 person or “no person” marketing department looks professional. And, you can track all of their activity and count the leads. Our editorial team works with you to identify the content in your organization and organize it into channels, themes and weekly episodes. An editorial calendar is produced for your approval. We put it all into context and produce the materials that surround it such as background graphics, email banners and layouts, tweet and Facebook updates, lead collection forms, and more. All you need to do is point us to your content. If needed, we can also produce new content for you, including infographics, ebooks, white papers, and hero videos. Repeat contacts made to inactive partners by phone and email. Single sign-on through popular providers like Microsoft, Google, and Facebook. Or, customized to your platform.